The Third Programme "will devote to the great works the time they require. It will seek every evening to do something that is culturally satisfying and significant. It will devote occasional series of evenings to some related masterpieces, a Shakespeare historical cycle, all the Beethoven quartets, or a series of Mozart operas. It will, so far as circumstances permit, be international. Concerts, operas, plays will be taken from abroad as landline conditions improve. Its talks will include contributions from the great European thinkers. Its whole content will be directed to an audience that is not of one class but that is perceptive and intelligent". 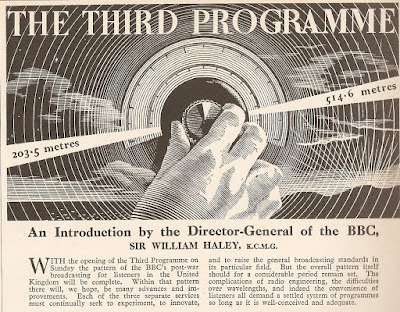 So ran the introduction from the BBC's Director-General Sir William Haley on the opening night of the Third Programme on 29 September 1946. But the first programme chosen to open the new service wasn't a concert, an opera, a drama or a talk but a comedy from Stephen Potter and Joyce Grenfel. "This is the BBC Third Programme," said announcer Patrick Butler. "How to Listen. Including how not to, how you ought to, and how you won't." The idea of launching with a send-up of highbrow listening was that of Leslie Stokes, the station's Assistant (Presentation and Publicity), who thought that "we ought to have a laugh at ourselves." Stephen Potter had been writing and producing for BBC radio since the mid-30s. He'd already appeared in a few How to ... programmes on the Home Service: How to talk to Children, How to Argue, How to Give a Party, How to Woo and so on. Turning freelance after the war he wrote comic books on Gamesmanship and One-Upmanship that would later form the basis for the delightfully funny film School for Scoundrels with Alistair Sim and Ian Carmichael. Narrator: Are they ready? Are they listening? Here, the house is empty - there, the set is switched off - but here, Licence number 865432, Mrs Moss, is she listening?Old Lady: Turn up the wireless, Mrs Moss.Mrs Moss: Yes, dear, it is chilly tonight, let's turn up the wireless a bit ...Producer (anxiously): Yes, but is she really going to listen?Narrator: On to another radio set. Where are we now? Let's look in at the window of Baltimore Gardens.Man: It's your call.Woman: I said four clubs.Man: Four clubs...I say, could we have the radio down a little, please? Woman: Yes, let's have it down a little. It's a bit difficult to concentrate on bridge. This was all too realistic. A survey conducted by the Daily Telegraph during the third evening of the Third gathered these, among other responses:Housewife: Bottling apples when the play started and could not listen. Now playing bridge.Business Man: Not the time. I play bridge. The genesis of the Third Programme can be traced back to a 1943 memo from Senior Controller Basil Nicolls who proposed a general 'Home Service'. a 'light' programme, 'popular', but not 'rubbishy', and an 'Arts Programme', which would be devoted to high-quality performances of masterpieces 'in all the arts amenable to broadcasting'. Controller of the Home Service, Sir Richard Maconachie, also attempted to carve up the radio networks to fit the available wavelengths. Programme A would be "cultural, for want of a better word" that would be directed to a "highly intelligent minority audience", Programme B would be 'Educational and Youth', Programme C would draw on regional material, Programme D would be like the wartime Forces Programme and Programme E would be 'light'. This proved too ambitious and all peacetime audiences got was just the Home, Light and Third, and they had to wait for over a year for the latter. The Third Programme was at pains to emphasise that the schedule would have no fixed points, if a concert overran then so be it. "The Third Programme avoids annotation" explained the BBC Year Book for 1947. "Comment on a work about to be performed is avoided, and silence - a full ten-seconds' pause - is regarded as the best cushion for a masterpiece. This leisured presentation in which silent pauses of up to four minutes have been allowed is one reason why the Programme has been described as unexpected and different from what is customary". Back to that opening night. How to Listen was billed as running from 6 pm to 6.45 pm but it under ran by seven minutes. "The timing was slipshod to say the least" said one newspaper. To fill the gap announcer Christopher Pemberton read some Henry James. A later four minute gap just before 8 pm remained just silent, save for twelve words from Pemberton. Bach's Goldberg Variations followed at 6.45 pm. Played by Lucille Wallace at the harpsichord they were introduced by yet another announcer on duty that evening, Marjorie Anderson. At 7.30 pm came a talk: Reflections on World Affairs by Field-Marshal J.C. Smuts. They had wanted Churchill for the opening talk but he was ill. The first concert on the station commenced at 8 pm with the BBC Symphony Orchestra conducted by Sir Adrian Boult and the BBC Chorus performing live at the Maida Vale studios with announcer Alvar Liddell introducing. The concert featured a specially commissioned Festival Overture by Benjamin Britten. The concert interval was Director-General William Haley's introductory talk referred to above. Following the concert at 10.10 pm was Living Opinion, a heavily-scripted discussion between "ex-Servicemen and others". The Star was not impressed: "The handful of woolly-minded men discussing ... were obviously reading it all out and despite careful producing it did not sound real." The rest of the evening consisted of Monteverdi madrigals on record, a repeat of a 1935 talk by Sir Max Beerbohm on London Revisited and, to close, the Epilogue. There were bouquets and brickbats from the press and listeners. "Haley's Third Symphony for orchestra and two listeners" jibed the Daily Mirror. The Evening Standard liked "the look of it" whilst the Daily Mail though "it demanded no greater feat of endurance than two hours of choral and orchestral music ... and the fragments of talk and music which made up the rest of the evening were easy enough on the ear". One listener thought it left "no time to do anything else except listen and I can see a succession of evenings in which meals will be prepared in ten minutes' time and eaten in five minutes". Another exclaimed "Today is the high spot of my listening life." So here is that opening programme, How to Listen. With Joyce Grenfel are Gladys Young, Betty Hardy, Louise Hutton, Carleton Hobbs, Geoffrey Wincott, Roy Plomley, Ivor Barnard, Deryck Guyler and Ronald Simpson. My recording comes from the Radio 3 repeat on 29 September 1986, hence the voice of announcer John Holmstom. As a bonus this is How to Broadcast that aired on the evening of the Third's fifth anniversary on 29 September 1951. The cast is Joyce Grenfel, Betty Hardy, Ronald Simpson, Deryck Guyler, Geoffrey Wincott, Alan Reed, Elwyn Brook-Jones, Carleton Hobbs and Roy Plomley. This recording is of the Christmas Day 1987 repeat on Radio 4 and includes an introduction from Laurie MacMillan.